The first church, the first military cemetery, the first university, the first .... . We've been seeing all of these places and even more. Boston is a cornerstone of the founding of the United States. 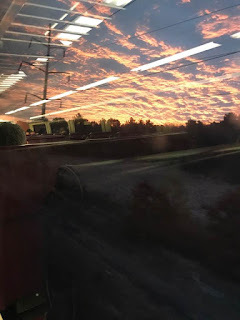 Our day started with a spectacular sunrise viewed from a fast moving train. Our tour started at 9:30 so we took the 7 am train into Boston to allow enough time in case we got lost on the 1/2 mile walk from the train station to the start of the tour. We made it with time to spare so we enjoyed a quick breakfast from Starbucks. There seems to be a coffee shop in every block-mostly Dunkin Donuts but also lots of Starbucks. We took a 'three hour tour' today and even returned safely. The places we saw brought to mind how much the citizens of our country sacrificed for freedom and independence. We visited Cambridge to see Harvard & MIT. Then on to Lexington to see the place where the first skirmish between the British and the Americans took place on April 19, 1775. Today we learned lots about Boston including how to get into Boston on the rail. There are many steps to it. 1) Find the train station. 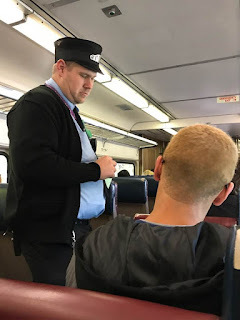 3) get a ticket or if you don't have enough time-just jump on the train and the conductor will sell you a ticket. We were in our seats with less than one minute to spare. 4) Figure out your stop and listen for it to be announced. All in all, it worked out well with just a few tense moments. After arriving in Boston, our first stop was to get a scarf for me and gloves for Tom. It was a beautiful sunny day but the wind was raw. We spent some time walking around neighborhoods. We ate lunch in a grocery store-they have a wide array of hot food that was tasty. Then we took a tour of Boston on a duck boat. The tour guy was funny but knowledgeable. The duck boat went on land but we also went in the Charles River and went under the Longfellow Bridge. The colors were in peak color as we drove across New York and Massachusetts. We drove through the Berkshire and Catskill Mountains. I couldn't help but think of James Taylor's song "Sweet Baby James". He talks about the Berkshires. Thankfully there was no snow today but a beautiful show of color. Our first stop in the Boston area was Salem-site of the famous witchcraft trials. 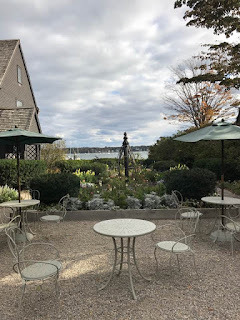 But it also the location of the many gabled house which was made famous in Hawthorne's novel The House of the Seven Gables. I have had a trip to Boston on my bucket list for many years. And we always planned to do it 'soon'. But this fall, Tom said that we had been putting it off for too many years. I said we are too busy to go this fall. He asked me, "When are we going to be less busy?" I didn't have a good answer and so we scheduled our trip two weeks ago. We left Alto on Monday, October 24. The first leg of our trip was through Ontario. So our first I stop was for lunch just across the border at a favorite restaurant of our family-Swiss Chalet. They are famous for their chicken served with a special dipping sauce. With that requirement check off, we headed across Ontarion and crossed back in the US near Buffalo.The drive from the 401 down to Niagara was through beautiful wine country. We especially liked the glimpses of Lake Ontario and kept on the lookout for freighters.